We’re live at the Lumia 1020 event. The details are already out, but the specs don’t tell the whole story. 11:03 am: Nokia CEO Stephen Elop onstage, reviewing the history of Nokia’s camera phones. He notes that the company filed its first imaging patent in 1994. The Lumia is actually the company’s second 41-megapixel camera phone, following the Symbian-based PureView 808. “We showed people details they had never seen before,” Elop said of that device. 11:08 am: Elop shows off the Lumia 1020, which will come in yellow, black, and white. The back is the new front, Elop says, showing off the camera with its 41-megapixel image sensor. 11:09 am: Elop brings up two PhDs on the company’s camera team — Kristina Bjorknas and Juha Alakarhu, both of whom worked on the PureView 808. 11:11 am: The sensor is the largest not just for any phone, but for any consumer device. “It means you can take incredible pictures in all conditions, especially in low light,” Elop said. But, of course, 41-megapixel images aren’t practical for sharing, so it also takes more optimized five-megapixel shots. This “oversampling” is also now being added to the phone’s video feature. That means that one can zoom in while taking video, without losing resolution — a feat not typically achievable on camera phones. 11:14 am: The Lumia 1020 has optical image stabilization, but Nokia had to redo things in order to stabilize such a large sensor. This time around, the company is using small, magnetically driven mirrors and ball bearings. 11:16 am: Now Elop is showing the same action shot being taken with the Galaxy S4, iPhone 5 and Lumia 1020. Not surprisingly, given that it’s Nokia’s demo, the shots are especially blurry on the rival cameras, and clear on the Lumia. 11:19 am: Lots more pretty pictures that take advantage of the 1020 and its six-lens Carl Zeiss imagery. 11:22 am: Elop and a colleague are now literally showing how one can find a needle in a haystack using an image from the Lumia 1020. “You can see things you’ve never seen before,” Elop said. The camera features are impressive, no doubt. But the key question remains whether people will pay a premium price ($299 on contract at AT&T) for a phone not running iOS or Android. Historically, Nokia has struggled here, especially in the U.S.
11:23 am: A key to the Lumia 1020 is a new Pro Camera app that lets one control settings from shutter speed to white balance and manual focus. Beginners can start playing with those features typically used by the pros, because the viewfinder shows in real time what those changes are doing. Photos can take long exposures of up to four seconds, something Nokia is now showing off onstage. They are doing it with the lights off, for maximum effect. 11:28 am: Elop moving on to some other features, including the company’s recently updated Here maps, which include an augmented-reality layer, public transit and offline maps capabilities. Elop quips that AT&T isn’t so happy that the maps work offline. 11:31 am: Developers will have broader access to Nokia’s camera features through a new software development kit. Among those that have been working with an early version are Yelp, Foursquare, Vyclone, Path and CNN, which is adding zoom to its iReporter app for citizen journalism. 11:32 am: On the new app front, Flipboard is coming to Windows Phone, Elop announced. Hipstamatic will have an exclusive app for the Lumia 1020 that will allow people to upload to Facebook, Twitter and Instagram. That last one is particularly important, since Instagram still doesn’t have a Windows Phone app of its own. 11:34 am: On the accessories front, Elop is showing off the wireless-charging shell, the $79 camera grip that allows better shutter control, a tripod mount and an extra 100mAh battery. “We look forward to selling a bunch of these,” de la Vega said, adding that the Lumia 1020 will set a new bar for camera photography. 11:39 am: It’s coming to AT&T on July 26, with preorders starting 10 days earlier. More details on AT&T’s site here. 11:40 am: Elop says it will start going to other places around the globe this quarter, including to China and some parts of Europe. An exclusive variant will ship with Telefonica to certain European and Latin American countries. 11:43 am: One thing to note — the Lumia 1020 comes with 32 gigabytes of memory, so, at the same amount of memory, it is priced the same as a comparable iPhone 5. 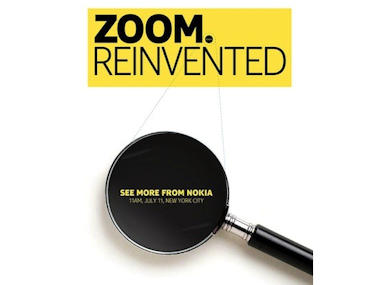 Elop says that Nokia will look to bring some of the 1020’s camera tech to midrange and lower-end devices in the future. 11:46 am: Asked what, besides the camera, will allow the 1020 to compete against the iPhone, Elop touted its screen, which works with gloves on and in bright daylight. 11:48 am: Questioner taking a lot of shots at AT&T, saying that Nokia has gotten “crummy” support from AT&T, and asking what Nokia is doing to get better treatment from carriers. Elop skillfully reframes it as a challenge that Nokia is knowingly taking on in opting to go with a third ecosystem in Windows Phone. “We stand by that decision,” he said. He teases a launch coming up later this year, and says that Nokia is working to do better and better with each launch in terms of getting support from carriers and educating consumers. Elop ends with an Ansel Adams quote noting that the most important part of any camera is the 12 inches behind the camera — that is, the photographer. With that, it’s hands-on time.